HST and 9 / 10 car 80x will only fit entirely in platforms 3, 13, & 15. Interesting about the HST's. Does this mean they will no longer be able to use other platforms? (GWR didn't used to use other platforms that often for HST's but it did happen, and XC still have theirs too). I suspect they'll still use 8 and 12 headed out for Taunton, but they'll block 7 and 11 in doing so? If you abolish Permissive Working you can potentially forget running the service we see today. There just isn't the capacity available at major stations to allow the timetables to work without it. Also, how would you operate 'Portion Working' without it. All methods of train operation involve some form of risk (any form of human movement does), but the risks need to be controlled as best they can, not prevented entirely, otherwise we wouldn't turn a wheel (or leave our beds in the morning). I usually get the 16:15 from Bristol Temple Meads to Bristol Parkway, and oddly since the signalling upgrade last week, this train has had to wait by the old for 5-10 minutes outside Bristol Parkway for a clear platform. Whilst I don't usually mind the delay, if I have a good book, but I finished my book Friday morning so I chose to investigate a bit more. Despite being told again that our 7 minute delay was waiting a platform, it was confirmed to me that that we where waiting for the London bound train that had priority for the junction outside Bristol Parkway, and it was nothing to do with platforms. This makes more sense, but why since last week has this happened? Is it design, bad luck or systemic? If it is by design, then no matter how many tracks they run from Bristol Parkway to Bristol Temple Meads then without major changes to junctions no extra trains can be run. Give up any idea of 6 London bound trains from Bristol, 2 Cross Country Trains and extra local traffic. If it is bad luck, are any other areas experiencing lots of regular delays, or is this just due to irregular and poor time keeping of trains. If it is systemic, why should local trains have to wait 7 minutes outside a station and not be waved through onto another track and platform, rather than waiting for a London bound train to cross a junction? If you abolish Permissive Working you can potentially forget running the service we see today. There just isn't the capacity available at major stations to allow the timetabes to work without it. Also, how would you operate 'Portion Working' without it. All methods of train operation involve some form of risk (any form of human movement does), but the risks need to be controlled as best they can, not prevented entirely, otherwise we wouldn't turn a wheel (or leave our beds in the morning). Beds are dangerous...most people die in one. Whilst I don't usually mind the delay, if a I have a good book, but I finished my book Friday morning so I chose to investigate a bit more. The local 2Dxx trains have pathing allowance in their timetable just before Bristol Parkway, so that the Cardiff to London train can get into Parkway platform 3 first. The ARS software mis-handled this allowance, expecting it to apply at the signal before the station. But that signal is AFTER the converging junction with the line from South Wales, so ARS used to route the local train into platform 4 first, causing the London train (if on time) to be delayed. The ARS system has now been updated, to recognise that the local has to be held on the curve from Filton Abbey Wood. So that now raises the question; how late does the Cardiff to London train have to be, before it's "right" to route the Temple Meads to Parkway train first? Why do those terminators not use P1 - isn't that one of the things it was built for? 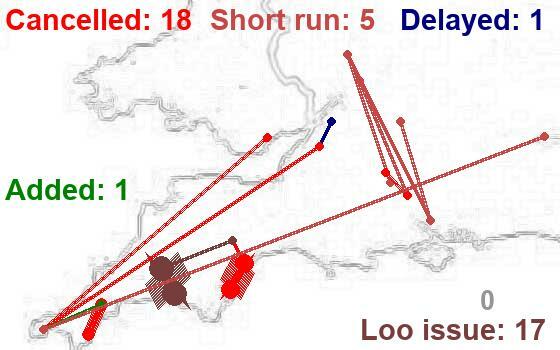 As it is, the other users of P1 and P4 are a few "trains in excess of platform capacity", mainly XC and GWR north-south, and P1 is unused at the relevant times. Plus that means they leave southward from a nominally south/west platform. 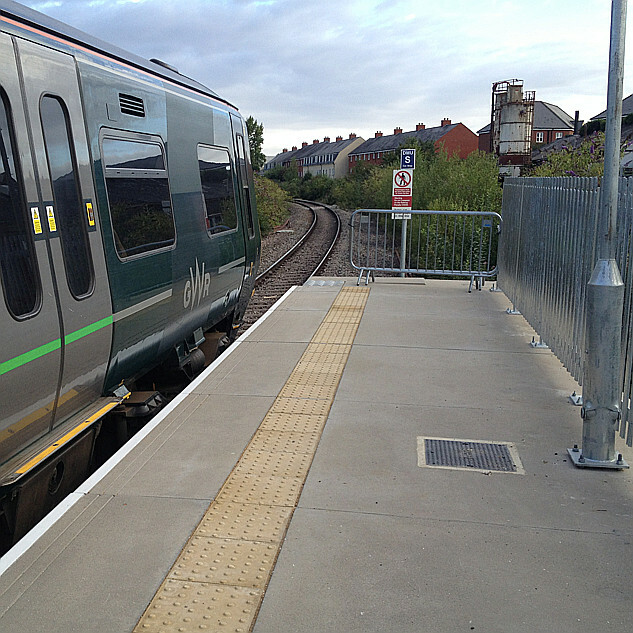 The move from the UP FILTON line to Bristol Parkway P1 has not been commissioned yet. The facing crossover and signal to allow this is at the old Filton platform site and that will be commissioned when the Filton 4 Tracking is commissioned at Christmas/New Year 2018/2019. Well, thats what the Signalling Scheme Plan shows anyway. Edit to Add: Same for Platform 2. At last - a man after my own heart! And a potential member of a new scam organisation I am starting, to help combat that most frequent killer of those who die in beds. I give you the Society for the Prevention of Natural Causes. Send money now. I've got one if you want to borrow it. I haven't coloured all of the pictures in, because my felt-tip dried up. Presumably, if it were done now, it would have to be rejigged when the four-tracking is finished, and the new platform at Filton Abbey Wood opened? Not totally sure but that is probably the reason FTN. It looks like a signal has been provided on the London end of Bristol Parkway platform 1. Presumably this means it will be possible to route trains from Filton/Cardiff through Platform 1 and out the other side towards London. I originally thought it would be a fixed red signal just for reversing moves back to Filton/Cardiff but it appears this isn’t the case. All the lines through Bristol Parkway will become fully reversible (including the Up Passenger Loop and Down Goods Loop). This will happen during the F4T commissioning later this year (2018). All these lines will be accessible from the London, Filton Abbey Wood, Patchway and Avonmouth directions.